Five hundred years ago, the German cartographer Martin Waldseemüller (1470-1521?) published an introduction to cosmography (the study of the universe) titled Cosmographiae Introductio.1 This work was accompanied by a globe and wall map, Universalis Cosmographia Secundum Ptholomaei Traditionem et Americi Vespucii Aliorumque Lustrationes. The 1507 map is a remarkable source, for it represents a European view of the earth in the years immediately following the first explorations of the New World. But it is especially valued for a more precise reason: it is considered to be the first map to use the word “America” to describe the New World. The term appears in the lower left panel of the map, and pays homage to the famous Italian explorer Amerigo Vespucci.2 Waldseemüller later published an atlas which used “Terra Incognita”—literally, unknown land—instead of “America,” but despite this apparent retraction, use of the term “America” spread. Like other colleges and universities in the United States, Vassar College maintains a collection of atlases and maps in its library. The holdings here do not have the breadth or depth of collections in larger institutions. Still, the holdings are impressive, and there are many highlights which greatly benefit students, faculty, and others interested in mapmaking and the history of cartography. Forty years after the acquisition of the Lasker Collection, another important cartographic collection came to the college. In 1977, the library received books, maps, charts, and related materials from Jocelyn Harrington Breed, ’36. The Breed donation significantly enlarged the library’s holdings relating to cartography. The largest group of materials is made up of maps, most of which date from the 18th century, though examples from the 16th through the 19th centuries are present. All parts of the world are represented, but there is a focus on Europe. There are also a number of interesting maps of the Americas, some showing the entire continent, and others focusing in on particular regions or states. Of special note among the maps dealing with America are Justus Danckerts’ Novissima et Accuratissima Totius Americae (1688), Herman Moll’s A New Map of Ye North Parts of America (1730), and Robert de Vaugondy’s Carte des Parties Nord et Ouest de L’Amerique (1772). There are also several maps from the 19th century which give changing views of the United States, and the West in particular. The tradition of alumnae donations of map collections has been continued in more recent times. In 2004, the Richmond John Rathbone Collection of Rare Maps was given to the library by Mary Rathbone Acker, ’56. This collection, though smaller than the Lasker and Breed collections, features several important 16th, 17th, and 18th century maps, including Sebastian Munster’s map of the Western Hemisphere (1552? ), Nicolaas Visscher’s Novissima et Accuratissima Totius Americae (1680), and Matthew Seutter’s Diversi Globi Terr-Aquei (1720). There are also four maps in the collection by Samuel Lewis, who drew the official maps of the Lewis and Clark expedition. These maps all date from the 1790s, and focus on individual states, including New York, Massachusetts, and Pennsylvania. Of course there are a number of atlases and maps that have come to the library not as part of any pre-formed collection, but rather as individual items. Some of these items are housed in the Department of Archives & Special Collections, and others reside in the Main Library. Both locations have atlases that were acquired through bequests of alumnae and others associated with the college. There are also a number of books that were purchased by the library from particular funds. Some of these atlases are large folios, while others are smaller in size. Many of them provide facsimiles of significant maps. The Main Library also provides access to many online versions of maps. Many historical maps, for instance, can be seen on one’s desktop via the Evans Digital Edition of Early American Imprints, 1639-1800. Users can search the Evans Digital Edition in a variety of ways, or browse relevant groupings, such as “maps.” Nearly two hundred 17th and 18th century online versions of maps are included here. The library catalog includes records that link users to other online sources for maps. Moreover, it should be mentioned that in addition to these map holdings, Vassar also has supplementary resources to help in the study of cartography. The Main Library has many reference sources in its reference section, its stacks, and online, which can assist those doing research on a particular map or cartographer. Some unique titles are also available in Special Collections. Needless to say, all of these items add substantially to the library’s holdings on geography and cartography. Viewed as a whole, the collection of atlases and maps that has been assembled by the library is a valuable resource that continues the Vassar tradition of learning by “going to the source.” Over the years these materials have been used by students and professors not only in Geography, but in a variety of scholarly disciplines. Regardless of approach, original materials such as these stimulate appreciation of historical artifacts in the mind of the beholder. What is more—and anyone who has examined maps with students in a classroom setting can readily attest to this—they are also able to suggest questions and encourage intellectual inquiry in unique ways. The Vassar Library exhibit “Mapping America: 500 Years of Cartographic Depictions” celebrates the quincentenary of Martin Waldseemüller’s map by showcasing it (in facsimile) and other maps depicting America from later centuries. Relying on library holdings, its main goal is to trace the historical development of mapping America. This could not be done in a comprehensive fashion, of course; instead, a representative approach is taken. As with any public exhibition, “Mapping America” early on presented certain design challenges. Perhaps the most immediate problem before us was the scope of the project. Would it include both North and South America? Would there be views of particular regions, in addition to views of entire continents? Another issue that we had to grapple with was which maps and which cartographers should be included to illustrate particular trends in cartography. Finally, there was the problem of the oversized nature of many of our maps; this meant that it would be difficult to place some originals in the available display cases. In response to these questions, we decided to include views of both North and South America, but to concentrate, particularly in more recent centuries, on North America. We have also highlighted continental views, though regional views are represented as well; it was felt that without regional views the story of mapping America would not be complete. A number of maps by famous cartographers are present in the exhibit, but we also included maps by lesser-known cartographers, or even maps where the cartographer was unknown, in order to suggest something of the variety of mapmaking. And we have tried, whenever possible, to include originals, though in some cases it was necessary to rely on facsimile reproductions. There are a number of highlights in the exhibit. The first item is the facsimile of Waldseemüller’s map (with its very sketchy outline of the Americas) and the last, from 2006, is a view of North America from space. These two items serve as intriguing “bookends” for the changes that have taken place in cartography over 500 years. In between we see several key trends. The 16th century is represented by maps of the great cartographers Mercator and Ortelius, as well as Munster. A reproduction of a Blaeu map represents the “Golden Age of Mapmaking” in the 17th century, though other interesting examples from this century are also included, such as a 1677 map of New England claiming to be the first one cut there. Maps from the 18th century, for instance those by Moll and de Vaugondy, reflect the concern among European nations for political boundaries in North America. 19th century maps in the exhibit document the ongoing development of the West. 20th century maps are especially interesting in their demonstration of the use of new technologies in mapmaking. As stated earlier, it is hoped that the “Mapping America” exhibit will provide an opportunity for members of the Vassar College community and others to examine changing views of one part of the world, and to learn about the wider contexts of these changes. Yet we are cognizant of the fact that, for reasons of space, many noteworthy items in Vassar’s collection could not be displayed at this time. We therefore encourage those with an interest to explore these additional holdings at their leisure, in the Main Library and in Special Collections, and indeed to look further, beyond this library, to learn more about the fascinating world of maps and mapmaking. A facsimile and translation are available in The Cosmographiæ introductio of Martin Waldseemüller in facsimile, followed by The four voyages of Amerigo Vespucci, with their translation into English; to which are added Waldseemüller’s two world maps of 1507, with an introd. by Joseph Fischer and Franz von Wieser. Edited by Charles George Herbermann. (Freeport, N.Y.: Books for Libraries Press, 1969). A facsimile of Waldseemüller’s map of 1507 is available in Die Weltkarten Waldseemüllers (Ilacomilus) 1507 & 1516 =The world maps of Waldseemüller (Ilacomilus) 1507 & 1516. (Innsbruck: Verlag der Wagner’schen Universitäts-Buchhandlung, 1903). For further study of maps of America, see Philip D. Burden, The mapping of North America : a list of printed maps, 1511-1670. (Rickmansworth, Herts. : Raleigh Publications, 1996), Walter W. Ristow, American maps and mapmakers : commercial cartography in the nineteenth century (Detroit : Wayne State University Press, 1985), and Seymour I. Schwartz, The mismapping of America (Rochester, N.Y. : University of Rochester Press, 2003). The library acquired the map in May, 2003. For more information, see John R. Hébert, “The Map That Named America,” available at http://www.loc.gov/loc/lcib/0309/maps.html. The most current source for information on the United States is Guide to U.S. Map Resources, edited by Christopher J.J. Thiry (Lanham, Md: Scarecrow Press, 2006). For a wider scope, see Olivier Loiseaux, World Directory of Map Collections. (Munich: KG Sauer Verlag, 2000). There are literally thousands of websites of potential interest. Places to begin include the site of the Library of Congress, at http://www.loc.gov/rr/geogmap/gmpage.html. 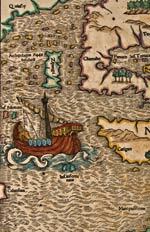 For Oddens’ Bookmarks to “The Fascinating World of Maps and Mapping,” see http://oddens.geog.uu.nl/index.php. For the history of maps, visit http://www.maphistory.info and http://www.davidrumsey.com. The Lasker collection was described in more detail by Professor Violet Barbour in the Miscellany News of October 13, 1937. A history of the Survey, and other information relating to the topographic maps, is available at http://topomaps.usgs.gov. For further information see Fire Insurance Maps in the Library of Congress: Plans of North American Cities and Towns produced by the Sanborn Map Company. (Washington, D.C. : Library of Congress : For sale by the Supt. of Docs, U.S. Govt. Print. Off., 1981). A short essay by Philippe Thibault, the instructor for this class, appears elsewhere in this publication.